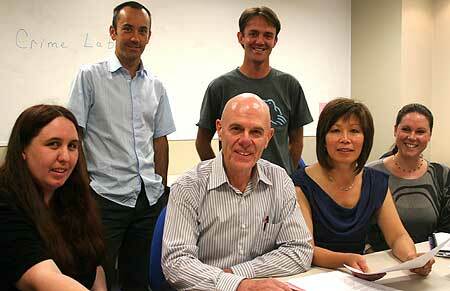 Crime research lab team: (seated) Heidi Brightmore, Dr Dave Clarke, Dr Mei Williams, Rebecca Leith and (standing) Kevin Austin and Hagan Provan. (Absent is Morgan Facey). The team of five post-graduate students is evaluating aspects of a motivational interviewing programme run by the Department of Corrections throughout New Zealand prisons. Collectively they hope to identify which elements of the programme are successful in rehabilitating prisoners, so they can make recommendations that will ultimately curb re-offending and reduce the number of people in prisons. The students in the clinical psychology team are studying the outcomes of the programme, the measures used, and the skills of the trained programme facilitators, as well as how a violence prevention programme can change offenders’ behaviour. The students are supervised by team leader, Dr Mei Williams, senior lecturer and psychologist specialising in criminal psychology, with the assistance of senior lecturer in psychology Dr Dave Clarke. Dr Williams says that generally offenders are not highly motivated to change their behaviour. The purpose of the one-on-one programme is to increase motivation to address their offending and engage in treatment. Hundreds of male and female offenders have been through the programme in the past four years. Motivational interviewing was developed about 30 years’ ago by psychology professors William Miller (United States) and Stephen Rollnick (South Africa). It focuses on developing the client’s intrinsic awareness of the benefits of changing their behaviour, and has been successfully adapted across a range of behavioural issues including substance abuse and mental health. Gordon Sinclair, National Manager from the Department of Corrections’ Community Probation and Psychological Services, says research into its programmes for offenders is encouraged. “We are pleased that Dr Williams and her team have come forward with research projects geared towards prisoner rehabilitation based on rigorous, sound social science,” Mr Sinclair says.